Fungi Forest is the fifth level of Donkey Kong 64, which is accessible after the player returns the Gloomy Galleon Boss Key to K. Lumsy's prison, and has collected 50 Golden Bananas. It is, as the name states, full of mushrooms. The stage centers around a giant Cuckoo Clock. The Cuckoo Clock has the ability to change day into night and vice-versa. Many areas are only accessible during certain times of the day. Enemies are also affected by time. They often become more hostile when the sun goes down. Dogadon is fought in a rematch by Chunky Kong here. This level also introduces blue Kong Switches, though a blue one does appear in the lobby of Gloomy Galleon. They can only be activated once the Kongs get the Super Simian Slam potion from Cranky Kong. Although this is the second level that Candy's Music Shop does not appear in (the first being Jungle Japes), her headphones can be found at various locations in this level. This area contains several barns and mills that house several creepy enemies. Inside these mills are mechanical tasks the Kongs will have to face to get their Golden Bananas. These tasks include walking on dimly lit planks, turning on a conveyor belt, killing Bats in the attic, and battling a giant spider with Tiny Kong only. Snide's H.Q. appears in this area, but is only accessible during the day. This area has a gigantic mushroom surrounded by water. Inside the fungus, the Kongs have to climb up the different floors of this mushroom to tackle bananas and bonus barrels. These floors also lead to terraces outside, which have many other tasks as well. Cranky's Lab can be found here. This area has a humongus redwood tree, inside of which sleeps the Owl that Diddy Kong must race (only during the night). Around the tree is a rabbit house, a smaller tree, and Lanky Kong's Kasplat. This area has a tomato patch with several Tomatoes surrounding an apple with a worm in it. Tiny Kong can plant seed in a hole which grows a giant living beanstalk. Funky's Store can be found here. Donkey Kong Inside the Mill, DK can enter a gate to Grip Grab the levers in a certain order. At night, DK can go outside and get his prize. At night-time, DK can use Strong Kong to go through the thorns into another room where he can play Minecart Mayhem for the Golden Banana. The player must use every character's weapon to hit all five switches, then DK can ride up the giant mushroom with cannons and get the Banana. At the Baboon Blast Pad, DK can play a Baboon Blast mini-level, and play Peril Path Panic, and win his Golden Banana. Where Banana 2 is found, DK's Kasplat is behind the entire thorn area. Diddy Kong At the top of the Mill, the player must enter the hole shoot the On Switch at the top of the winch, then hit the Green Up Switch with a Chimpy Charge. Diddy can go through the rafters near the rosebushes with the help of Squawks and get a Golden Banana. Diddy can Jet Barrel Boost up the hill into the Bonus Barrel, and he can play Teetering Turtle Trouble. Diddy needs to race the owl, go through all the hoops, and beat the owl, and then play Busy Barrel Barrage to win a Golden Banana. Diddy's Blueprint is found in the second floor of the Giant Mushroom. Lanky Kong At night-time, the player must go into the mill, and kill the Bats for the Golden Banana. At the top platform of the Giant Mushroom, Lanky can hit a switch, enter the newly-opened door, kill the two Zingers, and bounce on the mushrooms to win a Golden Banana. The player must press the same switch, and go through the other open door. They must travel into it, and then Super Simian Slam the mushrooms in order according to the chart, then play a round of Krazy Kong Klamor for Lanky's third Banana. Lanky, at daytime, can race the rabbit near the carrot home buried in the ground by blowing his Trombone Tremor on the pad. Beating him gives the player three Blue Coins. Orangsprint must be learned in Crystal Caves, and then he must be raced again for a Golden Banana. Lanky's Kasplat is under the big tree near Bananaport 4, which is also where the Rabbit is raced. Tiny Kong Inside the Giant Mushroom, Tiny can hit the Tiny Switch, reach the new Banana Barrel, and play Speedy Swing Sortie for the banana of gold. The player must use the Tiny Barrel behind the tree-stump, play the Sax on the Pad, have Squawks drop Tiny Kong in, and throw Oranges at the Purple Klaptraps. When they're all defeated, a Golden Banana and a strange bean are obtained, and they both must be grabbed. Using that very bean, Tiny can travel to the beanstalk area, watch it grow, go in the Tiny Barrel, play the Sax on the Pad, and have Squawks lift her to her Banana. At nighttime, Tiny must go into the Tiny Barrel, go through the tiny hole, and enter the hole. She’s must shoot the Giant Spider in the eye after defeating his tiny spider minions. She must repeat this process, and hit him when he's shrunk down to defeat it and gain a Golden Banana. Tiny's Blueprint is on one of the platforms around the Giant Mushroom. Chunky Kong The player must have Chunky put three oil barrels (one is found in a different room) on the conveyor belt after playing the Triangle Pad, and then go get the prize. Chunky can Super Simian Slam onto the gate above the well in the main area, and beat the Mine Cart minigame to win a Golden Banana. Chunky can use Hunky Chunky to summon the tomatoes in the Bananaport 2 area, and Super Simian Slam the tomatoes. Then he has to carry the worm all the way to the Apple marking on the ground. At the top of the Giant Mushroom, Chunky must slam the Chunky Switch in front of a wooden door, and solve the puzzle to form Chunky's face for the Golden Banana. At nighttime, Chunky needs to swing across the vines in the Giant Mushroom to fight the Kasplat and win the Blueprint. 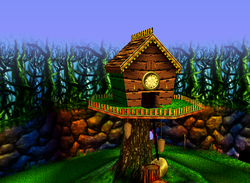 This level was originally going to be in Rare's other Nintendo 64 game, Banjo-Kazooie (where it was called "Fungus Forest"), but was instead added to Donkey Kong 64. The lobby theme is based on the track known as "Advent" which has been found in Banjo-Kazooie. The main theme for the level was originally composed for Banjo-Kazooie's predecessor, the canceled SNES game Project Dream. It was titled "Temple" by the composer of both Banjo-Kazooie and Donkey Kong 64, Grant Kirkhope. The boss battle against Dogadon in this level takes place in a lava arena, although the real level does not have any lava in it. There is a 5-Banana Coin in this level that went undocumented until January 28, 2017, seventeen years after the game's release. The collectible was first brought to public attention when Istorage, a member of the game's speedrunning community, datamined the game and found data for a 977th 5-Banana Coin located here; prior to his findings, they had assumed that there were only 976 of them in the game. The coin in question can be found in a dirt patch hidden in a patch of tall grass surrounding the DK Barrel just outside one of the mills. This page was last edited on March 7, 2019, at 01:01.